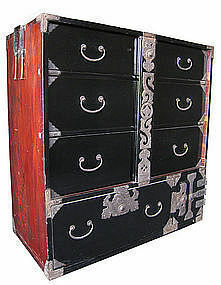 Antique Japanese tansu with locking bar over three drawers, one large bottom drawer with chrysanthemum lock, safe compartment with two small interior drawers and one secret compartment, opaque black lacquer finish on front, sides and top are a deep red translucent lacquer finish, iron hardware with scrolling design and mon on locking bar, Sakata area, early Meiji Period (late 19th century). 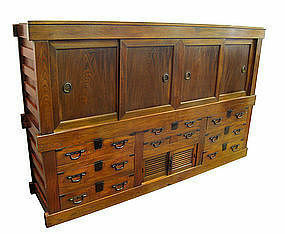 Size: 36" high x 35" wide x 17 1/2" deep. 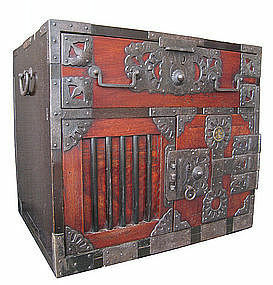 Antique Japanese small fune bako (safe box), made of keyaki (elm) wood with reddish orange translucent lacquer finish, single locking panel can be removed to reveal 5 interior drawers of different sizes, iron hardware including bamboo shaped exterior lock and chrysanthemum shaped interior lock, bronze interior drawer pulls, Sakata area, late Edo Period (c. 1850). 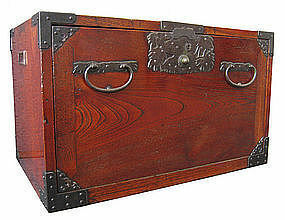 Size: 13" high x 21 1/2" wide x 14 1/4" deep. 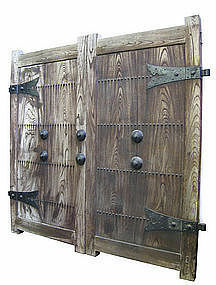 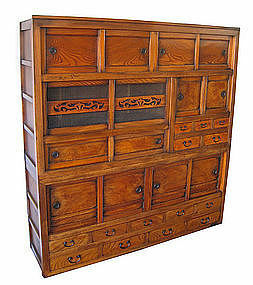 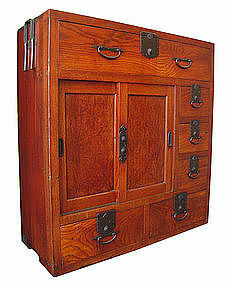 Antique Japanese fune dansu (merchant's ship safe), made of keyaki (elm) wood, heavy iron hardware including raised chrysanthemum buds in corners and on hinges, large iron chrysanthemum locks, sliding panel opens to 2 interior drawers, hinged door opens to 3 interior drawers, comes with 2 keys. 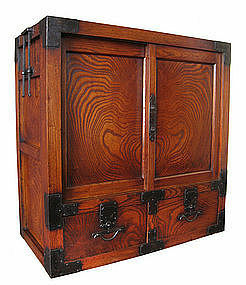 Dimensions: 19" high x 21 1/4" wide x 17" deep.